Nexus 6 proves that Google's Nexus program is not only far from dead, it's alive and kicking with a powerful 6-inch phablet that runs its latest Android software. It's bigger than the Note 4, but not better. Nexus 6 is Google's phone that's a year-and-a-half old that was solid, but has since been replaced by the even better Nexus 6P. This review has been updated regarding Motorola's design decisions. Google Nexus 6 is a supersized version of the Moto X 2014 that has been given a two-handed booster shot and, appropriately, received a post-surgery Lollipop. The results? It was briefly part of our best phones list in 2014 and into 2015. This phablet-sized smartphone was the first to run Android 5.0 Lollipop and, really, there is no better way to experience all of the changes Google has made to its Android N operating system beta, too. It parades the colorful Material Design interface on a massive 6-inch display, moves seamlessly between apps thanks to a Snapdragon processor and 3GB of RAM, and lasts one day with a large, Qi-chargeable 3220 mAh battery. These Nexus 6 specs are enough to edge-to-edge out Apple's mighty iPhone 6 Plus, and it feels better to hold in my hand, and typing is easier thanks to Androids always-superior keyboards options. Google Now, still one swipe to the left, is more personal than ever, which shows this phone is willing to go the extra .5 inches to please without BendGating over backwards. The Nexus 6 isn't for everyone, especially one-handed texters who think the 5.2-inch Moto X 2014 pushes the limit, or anyone who can't live without the presence-sensing Moto Active Display. Even Motorola has admitted it only made the phone so big because that's what Google wanted. It's also not as flashy as the newly launched Samsung Galaxy S7 Edge, as premium feeling as the all-metal HTC One M9, or as resourceful as the new Samsung Galaxy Note 5. But Google has also now released the Nexus 5X and Nexus 6P that are worth checking out before you head straight to buy a Nexus 6. 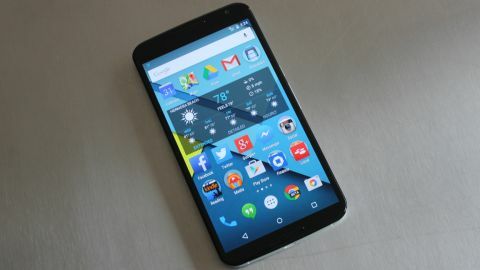 Google Nexus 6 was available worldwide on every major carrier following its initial early November 2014 release date in the US, and can install Android N. The phone is no longer sold in the Google Store, but it can still be sought online. At first, the phone was limited to AT&T, T-Mobile and Sprint, but Verizon began selling the Android phone with VoLTE enabled on March 12, 2015, four months later. In the UK, Vodafone and O2 were first to launch it. Now discounted to $349 via Amazon or officially $499 (around AU$670) for the 32GB Nexus 6 and $549 (around AU$738) for the 64GB version, Google has more its device more desirable. In the UK, the price drop has been even more substantial, with the 32GB version now going for £369 from the Google Play Store, with the 64GB version dropping to £419. At first, it was $649, £499 unlocked (AU$869), and much pricier than past Nexus phones. And that was just for the 32GB model. Google was selling the 64GB version for $699 in the US, £549 in the UK and AU$929 in Australia. On-contract, it has cost $149 through AT&T, down from the $249 upfront in the US, and in the UK plans started at as low as £32.50 a month with a free phone upfront. Nexus 6 was the first phone to support the search engine giant's experimental Google Project Fi cellular network. The previously invite-only program bounces between the signals of third- and fourth-place US carriers T-Mobile and Sprint with more forgiving and far cheaper plans for data usage. Project Fi could shake-up the overpriced service of traditional US carriers and, hey, Android updates wouldn't be as much of a problem since it's a network operated by Google. Although Nexus 6P and Nexus 5X now support Project Fi with even better specs, you may find that the Google Nexus 6 is the cheapest means to access the company's burgeoning mobile network. It takes two hands to properly operate the Nexus 6, but this Android phone feels better in my increasingly ambidextrous grasp for its size. Motorola's design, borrowed from the Moto X, gives it a sturdy BendGate-free aluminum metal frame and palm-pleasing gently curved back. It's sloped, so while the contoured sides run as thin as 0.15 in. (3.8mm), the thicker hump is 0.39 in. (10.1mm). The height and width are a normal 6.27 in. (159.3mm) x 3.15 in. (83.0mm). Nexus 6 pushes an edge-to-edge display with no physical buttons, so the - by comparison - "small" 5.5-inch iPhone 6 Plus isn't too far off: 6.22 in. (158.1mm) x 3.06 in. (77.8mm). At 6.49 oz. (184g), it weighs more than the new iPhone or Samsung Galaxy Note 4. But there's a good chance that if you can fit Apple's biggest smartphone in your skinny jeans, you're also going to be able to squeeze this oversized Android into a pocket too. You might not always be able to get it out as easily, especially when driving or sitting down. The curve feels natural against my hands, and the back, while made of hard plastic, is at least smooth. It doesn't try to mask the material with fake leather stitching or bumpy plastic. Nexus 6's shell is different from the rubberized Nexus 5, but I found it a lot easier to grip than its "premium," but far-too-slippery competitors that feature an all-metal design from top to bottom. With the aluminum iPhone 6, I felt like I needed a sleek-design-defeating case not to drop it. This is a familiar Motorola device almost all of the way through, down to the dimpled logo on the back where my finger automatically rested when on a call. But it skips out on the Moto Maker customizations like wood finishes and far-too-supple leather backs. Nexus 6 colors are limited to two: either Cloud White or Midnight Blue with the advantage of both being compatible with Qi wireless chargers, a feature all of those tricked-out Moto X phones don't support. It's also missing the Moto Active Display functionality. Waving my hand above the three IR sensors of the Moto X triggered a mostly unlit screen with just the current time and notification icons. Pressing down on these icons revealed more information like email teasers. Active Display is nowhere to be found here, even though it was a great a battery-saving idea that made notifications very glanceable. Instead, there's the less reliable Ambient Display mode that provides a greyed-out lockscreen whenever you lift the phone up suddenly. This doesn't always work. Nexus 6 misses the boat when it comes to a fingerprint scanner to rival Apple's Touch ID. Apparently, the iPhone-maker is inadvertently responsible for killing Motorola's biometric design plans because it bought supplier AuthenTec. You won't find a working LED light indicator here either. Recently, a developer discovered that the phone does emit one of these notifications pulses, but it's disabled. Turning it on requires a rooted phone. Also missing, or at least inconsistent, is the Nexus 9 tablet's knock-to-wake feature. It actually works sometimes and turns on that greyed-out screen, but other times I get no response at all. "Hello, is anyone home?," I keep asking. Maybe a firmware update can resolve this in the future but that hasn't arrived in the months since the original launch. Does this Cloud White cover make my Nexus 6 back look big? Nexus 6 does, thankfully, inherit the Moto X's ridge-filled power button. This helped me differentiate between the right-side located power and volume buttons in the dark. More phone manufacturers need to steal this design idea. I won't tell. Phablet manufacturers also need to take note of these front-facing speakers. The stereo sound is almost as good as BoomSound technology found in the HTC One M9 because it points the sound in the right direction. I'm tired of backward-facing speaker grills. At the top of the Nexus 6, at its frame's thickest point, is a 3.5mm headphone jack along with the nanoSIM card slot. Sadly, there's no MicroSD slot to speak of, which means you're locked into 32GB or 64GB configurations. It's also not waterproof like other IP67-certified Androids. It's merely "water resistant" and has Corning Gorilla Glass 3 protecting the 6-inch AMOLED display that I'll peer at next.